Your luxury haven will be appointed with the finest toiletries, linen and all the amenities you would expect from a 5-star hotel including the plushest of king beds with pillow menu and a separate lounge area to relax after your day’s activities. Every suite is incredibly spacious and thoughtfully designed to create your own private haven, featuring a separate sleep zone and lounge area. Floor-to-ceiling sliding glass doors open to the all-important ‘window to the world’, your own private verandah. Opulence, grandeur and style are taken to a whole new level in our Panorama and Grand Panorama Suites. Located at the front of the yacht, overlooking the bow on the upper decks, with spacious curved terraces, these grand suites will surpass your expectations. Your curved terrace is the perfect place to relax on a sun lounge and be the first to spot wildlife and incredible landscapes. Or put up your feet in your spacious lounge with a Kindle e-book from your in-suite library, and aperitif in hand. With a premier location on the higher decks, our opulent Spa Suites are spacious, providing a warm and inviting haven. Featuring a four-poster king bed, separate lounge room as well as a private verandah, they are the perfect retreat after a day of discovery. Each Spa Suite accommodates a double size Philippe Starck designed Jacuzzi overlooking your private verandah, and separate oversized steam shower. You will also be pampered with a complimentary spa treatment during your cruise. Handcrafted, sumptuous and extraordinary in every regard, staying in one of only two Owner’s Penthouse Suites is the ultimate indulgence. Your home away from home is located at the bow of the ship, on Deck 9, and boasts the best views on board. Featuring a spacious curved terrace with private Jacuzzi, outdoor lounge and sun lounges, these oversized suites surpass the comfort and amenities found in the finest hotels in the world, along with the extra special touches Scenic is famous for. 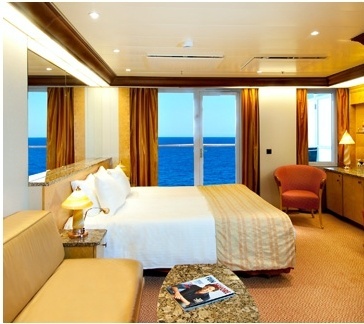 All suites onboard the Eclipse are appointed with the finest luxuries and are of the highest standards. The 2018/19 Antarctic season on the Eclipse sold out extremely quickly, so registered and hold your cabin now for when bookings open in early 2018. Enquire now for availability and cabin pricing options. This 23 day cruise from Longyaerbyen to Bergen will take you to the Arctic to spot Polar Bears as well as exploring the amazing Fjords of Norway. Enjoy the endless summer days, try to spot Polar bears and discover the northernmost islands on this 11 day discovery cruise in the Arctic circle.